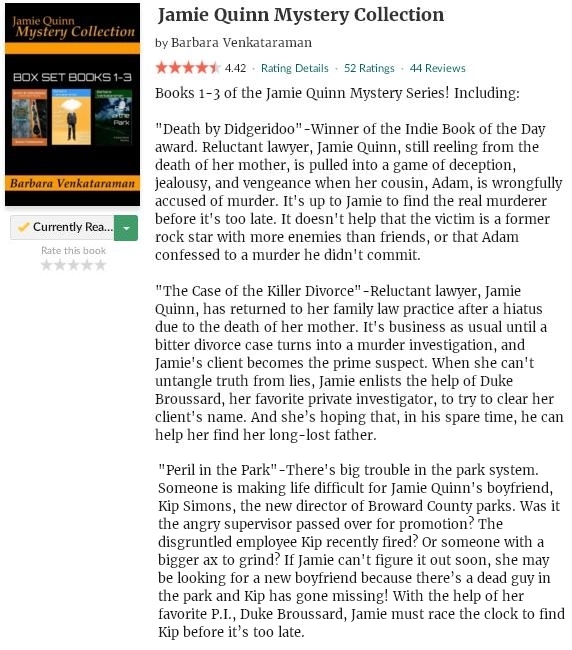 I can always enjoy a good cozy mystery read, so when I was approached by the author if I wanted to read and review her collection of three Jamie Quinn stories it was easy to say yes. And Death By Didgeridoo, The Case Of The Killer Divorce and Peril In The Park are without doubt fast-paced and entertaining cozy mysteries that are perfect vacation material. A huge bonus: since important character background is repeated in each sequel, it’s really easy to read them separate as well. The main character herself, Jamie Quinn, is a family law lawyer in a town called Hollywood and I liked the way her character develops during the three books. She sure has some surprises in store for her that are not related to her cases at all! The balance between the cases, PI work and Jamie’s personal life is well done, especially in the first and third book. Peril In The Park is without doubt my absolute favorite of the three, but the other two stories are good as well. If you like cozy mysteries and are looking for a fast-paced and entertaining read, this collection by Barbara Venkataraman is without doubt recommendable. Family law lawyer Jamie Quinn is still struggling to deal with the death of her mother, but she is forced to get back to action when her cousin is wrongly accused of murder. Adam is autistic and the whole experience is highly traumatic for him… And the worst part is that the police seem to think he is guilty. It is up to Jamie to find the real murderer before it’s too late, because the case is getting a lot of media attention. The victim is a former rock star with a lot of enemies… But who killed him? Jamie asks for the help of an old client and PI, Duke Broussard, but the clock is ticking. Jamie Quinn has returned to her family law practice after she had to deal with her cousin’s case. Things are going well enough, until a bitter divorce case turns into a murder investigation. Jamie’s client becomes the prime suspect, and she decided to yet again hire Duke Broussard to try and clear her client’s name. There are a lot of lies floating around, and it is getting difficult to find out the truth… And it’s not the only thing that goes around in Jamie’s head, since she is also trying to find her long-lost father. Someone is trying to make things difficult for Jamie Quinn’s boyfriend. Kip Simons is the new director of Broward County Parks, but it seems like not everybody is happy to welcome him. Someone has been vandalising the parks and there are a lot of unhappy people on the list of suspects. An angry supervisor that wanted the job himself, fired employees… They will have to figure it out soon, because someone has even threatened to do harm if Jamie and Kip don’t back off. Jamie has to call in the help of Duke Broussard yet again to solve the mystery before it’s too late. If you like the genre, you will without doubt enjoy these three cozy mystery stories as well. They turned out to be easy to read, fun and fast-paced. All three stories have the perfect mix of contemporary, mystery and legal thriller elements, although the third story Peril In The Park is my absolute favorite. Without doubt recommended for fans of the genre!